Memory cards are used in digital cameras, music players, smartphones, tablets, and even laptops. But not all SD cards are created equal — there are different speed classes, physical sizes, and capacities to consider. Different devices require different types of SD cards. Here are the differences you’ll need to keep in mind when picking out the right SD card for your device. 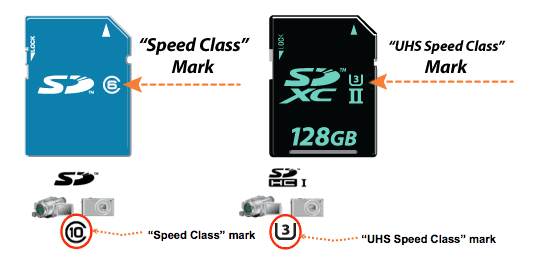 Speed Class and UHS Speed Class* symbols indicate minimum writing performance to ensure smooth writing of streaming content such as video shooting. This is important mainly for camcorders, video recorders and other devices with video recording capabilities. **UHS (Ultra High Speed), the fastest performance category available today, defines bus-interface speeds up to 312 Megabytes per second for greater device performance. It is available on SDXC and SDHC memory cards and devices.